Many of you have lost your jobs or seen your hours cut back like I have. Money is scarce and you can see and feel how hard life is at this moment just by looking at your friends and neighbours. Be very careful as you look for new opportunities because there are many predators who know of your desperation. They guarantee you a job in some far off place if you’ll send them money. They tell you a fortune awaits if you’ll send them money. They have knowledge of a system and they will share that knowledge if you’ll send them money. I read the book “BLINK” by Malcolm Gladwell and I learned what I already knew: Our “snap judgements” are usually correct even if we can’t always put into words why we immediately thought as we did when we first saw something, met a new person or heard an idea. What does your snap judgement and gut feeling tell you about Organo Gold? 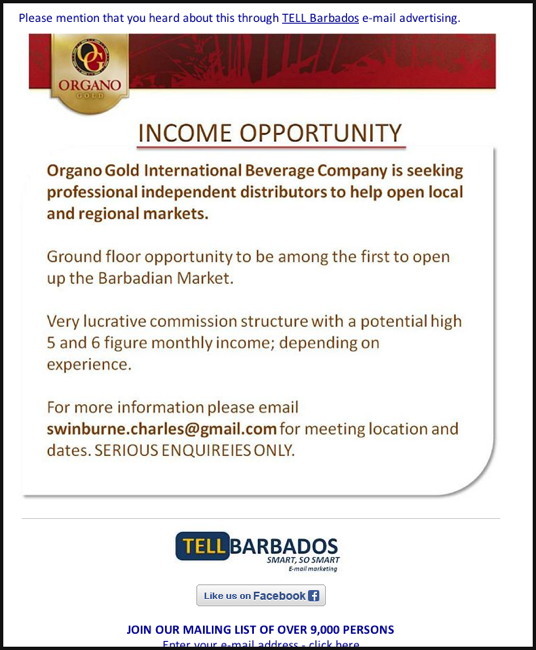 Almost ten thousand people received the Tell Barbados marketing email about Organo Gold “Professional Independent Distributors Needed”. (click on photo at left for a large image) I was interested in making some money because I’m getting cut back on hours at work so I started looking into the Organo Gold coffee products and business on the internet. This is ‘healthy’ coffee that has or is supposed to have some health-promoting plant ingredients. That is the brand’s claim anyway. It is a multi-level marketing scheme, not that I’m saying that is a bad or good thing except everybody has seen friends try things like this and a few months later you never hear about it anymore. Some people can probably make good money selling anything, but that’s not me. After a few hours on the internet I am no further ahead trying to discover if this is a proper opportunity or a scam. There is a lawsuit filed some time ago by one of the originators of the Organo Gold company named Jay Noland. He or someone taking his side put up a website where you can listen to long rather boring recordings of Jay Noland making accusations against his old partners still at Organo Gold.